You are staying on St. Thomas and are considering a day trip to beautiful St. John. Wondering what to do? We have a suggestion for you. 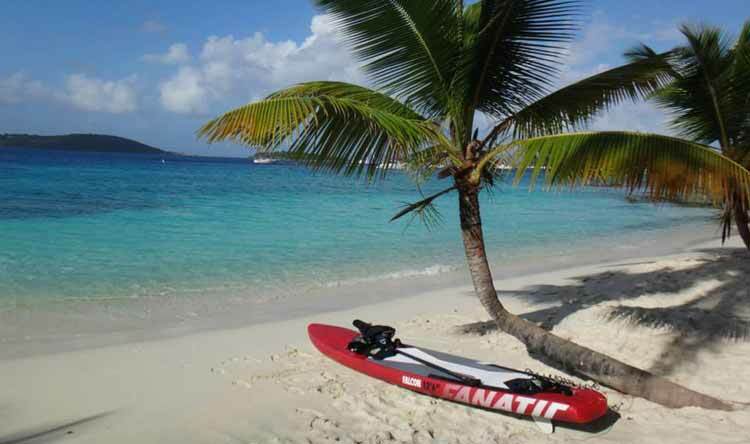 Come over to St. John and explore the beautiful North Shore Beaches on a paddleboard! There is an hourly ferry from Red Hook which is 14$ round trip for adults. The new ferries are super comfortable and fast and take only about 15-20 minutes. They run from 5:30 AM until midnight. You can check the ferry schedule here. You can also take the car barge but that costs 60$ return and is quite slow, also you need to check with your rental company if they allow you to take car to St. John. If you choose to come over by passenger ferry we can meet you with paddleboards right on Cruz Bay Beach only a few hundred yards from where the ferry arrives. If you have not paddled before you can learn to paddleboard with us in about 2 hours. It is really easy, anyone can do from 6 year old kids to seniors. After the lesson you can paddle over to Salomon, Honeymoon and Caneel Beaches. If you have paddled before we can deliver the boards right down to the beach and you can go exploring. You might also want to bring over your snorkeling gear, or you can rent a set from us. We also have drybags in which you can safely store your gear while you paddle. Salomon is a small, tranquil unspoiled beached that cannot be reached by car. Depending on the conditions and your level of experience, it takes 10-30 minutes to paddle over there from Cruz Bay. It is the first beach you will reach after paddling out of Cruz Bay. Lucy will explain you how to get there when she delivers the boards. The next beach after Salomon is honeymoon, it has a small shop where you can by drinks and snacks and there are restrooms. There is some good snorkeling around the rocks between Solomon and Honeymoon Beach. The next beach you will reach is Caneel Bay, home of the famous Caneel Bay Resort. All beaches are public so you can go on land there but please respect that the beach chairs and loungers are reserved for guests. Feeling hungry after the paddle? You can have some amazing food at their Beach bar and grill (make sure you bring a shirt / cover up if you would like to eat there). The food is fanastic and they have amazing Sushi until 3pm. Check out their lunch menu and sushi menu here. Ready to paddle back? Just send Lucy a text when you are about to head back and she will meet you in Cruz Bay to pick up the paddleboards. If you choose to come by car barge, Lucy can meet you with the the paddleboards on the parking lot next to the barge exit and you can go and explore the island with the boards strapped to the roof of your car (we provide soft racks that make mounting them super easy). For a directory of beaches to explore, check out this article.